The Denver Preschool Program (DPP) is celebrating good news. According to new findings, children who participated in this program have shown reading gains compared to their peers. Participants have gone on to earn higher scores on the state’s third-grade reading test — the Transitional Colorado Assessment Program (TCAP) — than peers who did not participate in the program. “A total of 64 percent of DPP children posted advanced or proficient reading scores compared to 58 percent of non-DPP students,” according to a Denver Preschool Program press release. 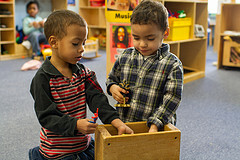 “When you really dig and look into the data you’ll start to see that something is going on that is really positive,” Denver Preschool Program’s CEO Jennifer Landrum told the Denver Post. This is an important finding, and it adds to a growing list of studies that connects preschool participation with third grade reading outcomes. Denver’s program is publicly funded through a citywide 12 cent sales tax on purchases of $100 or more. The program seeks to increase access to high-quality preschool for all four-year-olds, and “thus increase the likelihood that children will be successful in kindergarten and beyond,” according to a DPP memorandum. The program is voluntary and universally offered – currently 70% of Denver four-year-olds attend. Compared to students not attending the preschool program, DPP students are more likely to be Hispanic (62% versus 56%) and more likely to be from low-income families eligible for free- or reduced-price lunch (74% versus 69%). The program also incorporates parent choice: families can choose from preschool options in community-based centers, family child care homes and Denver Public School classrooms. To promote access, DPP offers tuition assistance to all families on a sliding scale based on family income, family size, and the quality rating of the preschool the child attends. DPP helps all of its programs earn quality ratings from Qualistar Colorodo, the statewide QRIS, then invests in coaching and professional development for teachers to help programs improve their quality. Comparing students within racial/ethnic categories revealed higher reading proficiency rates for those students who had attended Denver Public Preschool. Other researchers have found similar links between preschool participation and reading abilities. A study from Duke University found that two North Carolina preschool programs “generate moderately large average positive effects on both reading and math scores in third grade.” And we wrote about another study that suggests that children who hear sophisticated language in preschool tend to be better readers by fourth grade. Denver serves as a role model, particularly for other cities looking for new ways to fund expansions of preschool access (click here for more background on how the DPP was created and funded). The new evaluation evidence of the program’s impact on child outcomes adds to the mounting evidence that high-quality early education is linked to children’s ongoing language and literacy development. on April 13, 2014 at 3:04 PM | Reply What are the Advantages and Disadvantages of Preschool Education?